Nashville native and Red Sox catcher Bob Montgomery was born Robert Edward Montgomery on April 16, 1944. 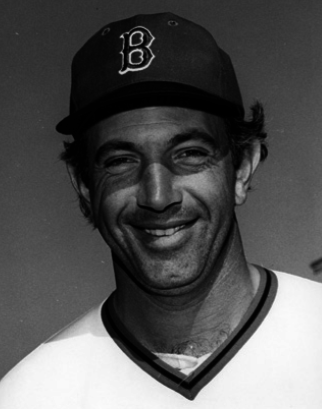 He played his entire career with one major-league team – the Boston Red Sox – a career that encompassed the 1970s, from his debut on September 6, 1970, to his final game on September 9, 1979. Monty took a while to make the majors, initially signing as an amateur free agent with the Red Sox on June 9, 1962. Baseball ran in the family. His father played sandlot ball and was apparently pretty good. Bob’s younger brother, Gerald, was also in the Red Sox farm system for a while as a pitcher. Bob himself played several sports for Central High School in the Tennessee capital, and was all-state in three sports, but it was always baseball that held the greatest appeal. For Central, he pitched, played first base, and played outfield. It was only later that he made the move to set up behind the plate. After high-school graduation, Red Sox scout George Digby got Bob Montgomery’s signature on a contract and the 18-year-old was assigned to the Olean, New York, team in Boston's farm system. There he played outfield and third base and batted .273, earning him a step up in the system in 1963. The new year saw Montgomery playing in Waterloo, Iowa, under manager Len Okrie. Monty explained to author Herb Crehan that Okrie suggested he become a catcher. Okrie told him, “If you want to make it to the majors, you're going to have to make yourself into a catcher. You don't have the power to make it at the corner positions in the majors, but you could make it as a catcher.” Monty got in a little backstop work late in ‘63, though Baseball-Reference.com shows him exclusively as a third baseman. The following year he served as the primary catcher for Waterloo and even made the league's All-Star team. He told Crehan that he’d found the transition a relatively easy one. Although it was a long slog to make it to the majors, Monty said he never got discouraged. “I never thought about quitting. I had one goal in mind: to play baseball at the big-league level. I stayed focused on that goal and just moved a little closer every year.” He continued to rise in the system, if slowly, and by 1969 was playing for Triple-A Louisville, the top club in Boston’s system before Pawtucket assumed that honor. Montgomery played in over 100 games and batted a very strong .292. In 1970 Montgomery put in another year at Triple-A (hitting .324 in 131 games, and showing some power with 14 homers), and earned himself a call-up to the big-league club once Louisville’s season was over. Montgomery made his major-league debut, subbing for catcher Tom Satriano in a game the Sox were losing 6-1 to the Baltimore Orioles. He was called out on strikes in his first at-bat, but came up again in the Red Sox sixth with Dave McNally on the mound and runners on first and second and a run in. His single to right field moved up both Rico Petrocelli and Billy Conigliaro and loaded the bases. Two runs scored on a hit-by-pitch and a sacrifice fly, and the score was 6-4. The Red Sox went on to win the game in the bottom of the 11th when reliever Pete Richert loaded the bases and then threw a wild pitch as Billy Conigliaro stood in the batter’s box and Montgomery waited in the on-deck circle. Monty took over as the regular catcher for the rest of the season. The first of his 23 career home runs came a few days later, a September 11 solo homer in the fifth inning off future Hall of Famer Jim Palmer. Montgomery saw a lot of action in September, playing in 22 games and performing reasonably well (just three errors, while being credited with 143 putouts and 13 assists), though hitting a little anemically at .179. He threw out 47 percent of baserunners in stolen-base attempts. He enjoyed the winter months, with 14 major-league hits in the record books and what looked to be a steady job in the majors in 1971. Duane Josephson was acquired over the winter to be the regular catcher, but a series of nagging injuries provided plenty of opportunities for a backup to play, so Montgomery shared catching duties in 1971. Josephson appeared in 91 games and hit .245 with ten homers while Montgomery got into 67 games, hitting .239 with a couple of homers. Carlton Fisk was called up in September and made himself a catcher who would not be denied. His .313 batting average and great defense ensured that he would take center stage starting in 1972. Montgomery understandably played the backup to Fisk, and appeared in just 24 games. He upped his average appreciably to .286, however, taking full advantage of the at-bats he had. The Red Sox missed winning the pennant by just a half a game in a season that opened late due to a player strike that was not resolved until several days into the regular season schedule. Montgomery saw a little more action in 1973 – 34 games, 128 at-bats, and again a significantly improved batting average. He hit .320 in 1973. To work as a backup catcher isn’t the easiest of tasks, he told Herb Crehan. You have to be ready to step in and perform at any minute. “I focused on every single pitch, even if I hadn’t played in a week.” The attention to detail is key in a catcher, as reflected in Montgomery’s climbing batting average, and probably served him well in his later career as a broadcaster with the Red Sox. When Carlton Fisk suffered a season-ending injury on June 28, 1974, Montgomery stepped in and appeared in 88 games, with Tim Blackwell serving as his backup. Monty's average dropped to .252 but he filled in capably and the team continued to contend, remaining in first place until shortly after Labor Day. Fisk was still unable to return as the 1975 season opened, due to a second injury – a broken arm suffered in spring training – and Montgomery was the main man strapping on the mask and chest protector and calling pitches for the 1975 team until Fisk was able to come back on June 23. Though his average slipped yet again, to .226, Monty played in 62 games and did his share to keep the Sox in the hunt. At the season's start, Montgomery was responsible for the game-winning RBI in four of the first 11 wins. Fisk hurt his finger in August and Monty got quite a bit of playing time in September. He also started a couple of games at first base, filling in there six times before season's end. In postseason play, Montgomery saw no action at all in the three-game ALCS victory over Oakland, and almost missed out on any action in the World Series. He finally got his chance at almost the last possible moment, appearing as a pinch-hitter in the bottom of the ninth inning in Game Seven. Will McEnaney was in for Cincinnati to protect a slim 4-3 lead, and there was one out, after Juan Beniquez flied out to right. Monty could have become an instant hero with a home run over everything to left, tying the game and setting the stage for Yaz to come up with a winning back-to-back blow. Alas, it was not to be. Monty grounded out to the shortstop. Yastrzemski flied out to center field and the Series was over. There was every hope that the Red Sox could come back and contend again in 1976, but they never got on track. Ownership even fired manager Darrell Johnson in the middle of the season, handing the reins to Don Zimmer. With Fisk healthy the full year, Monty got into only 31 games but did boost his average to a more respectable .247. Montgomery got even less playing time in ’77, but batted an even .300 in 40 at-bats, with a couple of homers in the mix. The year 1978 was another exceptional Red Sox season. Fisk played in almost every game in 1977 and 1978, and Monty saw action in only ten games; he hit .241 in 1978 on the strength of just seven hits in 29 at-bats – and more than half of those hits all came in one game, the second game of a May 21 doubleheader in Tiger Stadium. Montgomery was 4-for-5 that day, with an RBI triple in the ninth inning off Fernando Arroyo. The last game he was in, as the pennant drive was on in earnest, came against the Yankees on September 7 at Fenway, a 15-3 blowout for New York. He had two plate appearances, striking out the first time and drawing a walk the second. The last year of the 1970s was the last year for Bob Montgomery as a major-league ballplayer. He went out with his head held high, appearing in 32 games and batting a career-best .349 in 86 at-bats. When he played his final game (September 9, 1979), he was 1-for-2 and scored a run, and also earned the distinction of being the last major leaguer to ever bat without a protective batting helmet on his head. Though he tried to make the team in spring training in 1980, Montgomery just didn't have it any more. In April he turned 36 and the Sox were going with Fisk and Gary Allenson (Allenson had seen a lot of work in 1979, though with distinctly less production at the plate than Montgomery. He turned only 25, though, in 1980 and the Red Sox elected to look to him to spell Fisk.) In 1980 and 1981, Monty worked a little in sports radio and did some Red Sox games on radio as a backup guy. For the 1982 season, WSBK, Channel 38, was looking to hire a new color commentator and interviewed Tony Conigliaro for the position. Tony's heart attack removed him from consideration and Montgomery was hired to do the color on Red Sox telecasts. Monty worked as Ned Martin's partner doing TV for the Red Sox for 17 years, right up through the 1995 season, when Channel 38’s run with the Red Sox came to a close. He later worked as a color analyst for both the Pawtucket Red Sox and Portland Sea Dogs. He is credited with winning 11 Emmy Awards. Montgomery began working in sales and marketing for Unison, a company based in Boston that specializes in signage work, and later for Adventures in Advertising, a marketing firm, involved in sale promotions and marketing premiums. He has also done work as a motivational speaker. Bob Montgomery is a licensed pilot and an avid model railroader and golfer. He and his wife had one daughter. Most of the information in this article, and all of Bob Montgomery’s quotes, come from Herb Crehan’s profile of Montgomery contained in his book Red Sox Heroes of Yesteryear (Cambridge, Massachusetts: Rounder Books, 2005). The always-helpful Retrosheet.org website provided a wealth of detail regarding Montgomery’s year-by-year and even day-by-day play.